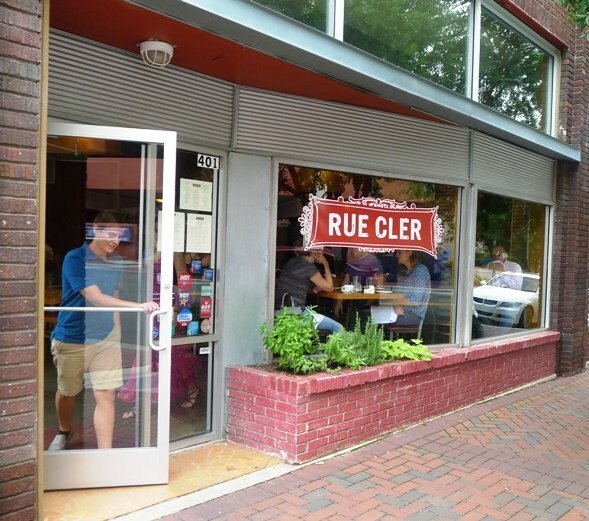 Tucked away off of Chapel Hill Street not too far from DPAC is the tried and true, Rue Cler! A french bistro and restaurant, I had visited Rue Cler years ago on a Taste Carolina food tour and have intermittently come back to visit from time to time. For some odd reason, French food is usually not on the top of my To Eat list because I’m not a fan of escargot, cold cheese and pate. But put a steak frites or croque madame in front of me and I’m all in! 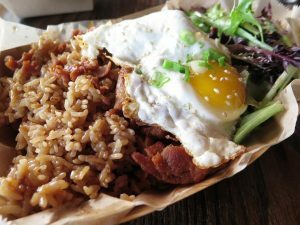 Rue Cler does a little bit of everything, working well for brunch, lunch or dinner, let’s find out why! 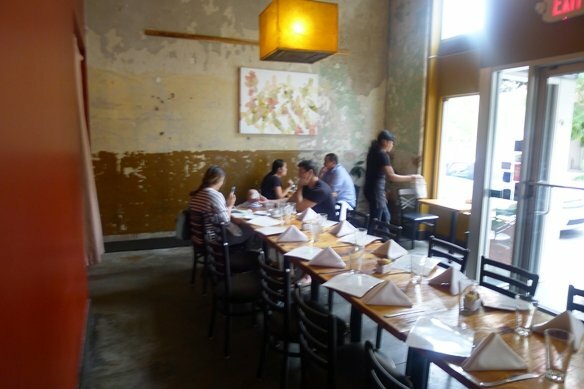 Inside Rue Cler you’ll find a large open dining room with a bit of a weathered feel. Antiqued walls, partially exposed plaster, concrete floors and more give the space a European feel. Basic cafe seating and waitstaff decked out in crisp white shirts and black pants makes it all feel quite proper. While I’ve been here a couple of times for dinner, today’s visit is for brunch and a large group of friends take over the side-room for some afternoon eats. Our wait-person starts us off with some wonderfully, rich coffee along with the requisite mimosas and bloody mary’s. 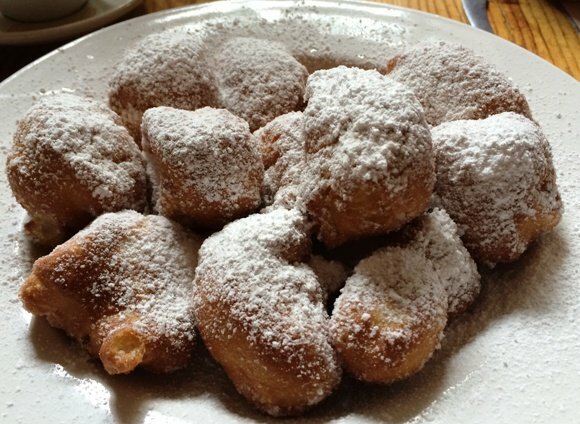 I start off the table with a plate of beignets, there’s nothing like some fried dough and sugar to get your day going. And the beignets at Rue Cler are fantastico! Fried up without much grease, crisp on the outside, dense and yeasty on the inside, they are excellent starters for your brunching. We put in our orders for our mains which range from french toast, mussels, duck crepes and croque madame and it’s time to hang loose. It takes about 20 minutes for our next service given the size of our table. With a lot of the sandwiches you can choose from a green salad or frites but you can guess where I’m going! My croque madame looks AWE-some! A hefty portion of thick-cut bread with cheese, two fried eggs and some ham inside. The frites are beautifully fried along with some mayonnaise for dipping. I cut off a piece of the sandwich and there’s just the right amount of bread, ham, cheese and egg. 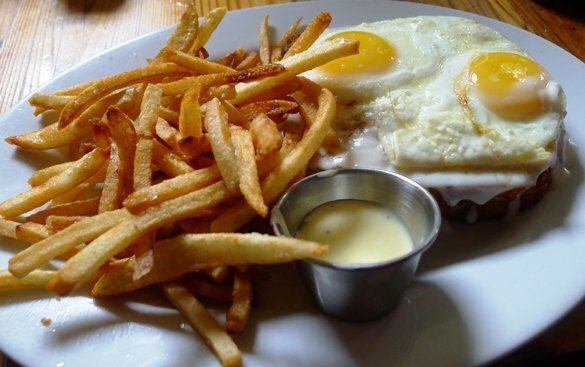 I’m not sure who invented the croque madame but thank you! And the fries make for a great side when I add in a bit of ketchup. Sorry for being American! 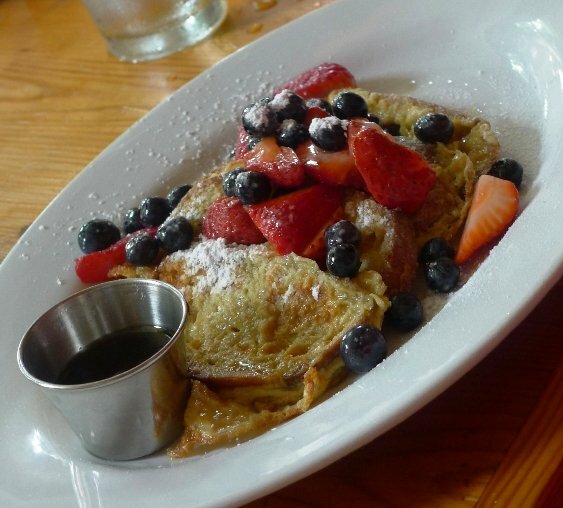 All the other dishes at the table looked pretty good, particularly the french toast and fruit, next time. Service for our large table was not easy but our wait-person hung in there but seemed a bit stressed out. Rue Cler is pretty busy for brunch. Prices are reasonable, service is solid and decor is pretty rustic so I can understand why Rue Cler is a popular dining destination. So if you’re in downtown Durham or waiting for a show at DPAC, definitely put this French eatery on your short list. 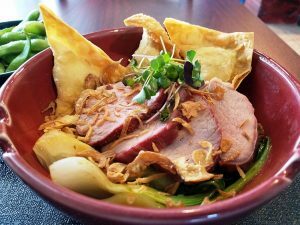 And while it may not be as popular as other downtown Durham hot spots, that may be a big advantage on a busy night. Because Rue Cler still does a very good job at dishing out tasty French bistro fare at reasonable prices. And there’s nothing wrong with that whether you’re talking brunch, lunch or dinner, bon appetite!